A yearlong study of the West Tisbury Mill Brook watershed began Wednesday. Mill Brook Watershed Management Planning Committee co-chairman Chuck Hodgkinson said preliminary work will begin on the installation of data loggers to record various aspects of the watershed environment. The study will set a baseline from which the changing conditions of the watershed can be monitored, he said. The study will include data collection from specific sites to measure rainfall, and to analyze nutrients and chemicals in the water and water quality. 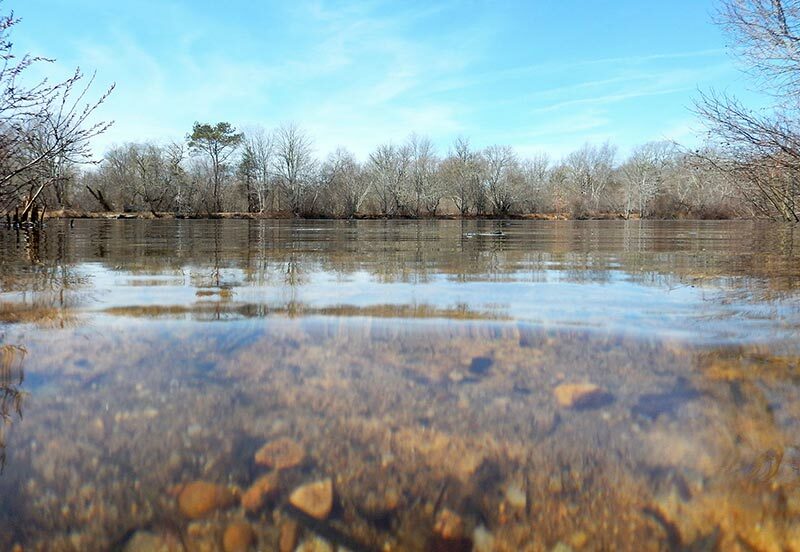 The study will monitor water sources, diversions and withdrawals, water flow and temperatures, and will record seasonal weather impacts and the impact of existing and potential sources of threats to the health of the watershed. Mr. Hodgkinson said the study is unique to the Vineyard in the breath of cooperation between at least seven local organizations and private volunteers who will do much of the work, and in the donation of $5,000 from the Martha’s Vineyard Commission to the study. The study is managed by the sole bidder on the town’s request for proposals (RFP), ESS Group, an environmental consulting and engineering services company, which agreed to accept help from volunteer groups and individuals in order to scale back the costs of its bid, which exceeded the $30,000 approved at town meeting in April 2014 by $15,000. The Mill Brook study committee will ask for an additional $6,600 at the annual town meeting on April 14 to cover additional costs to complete the study. A request for $25,000 will be reduced to $6,600 on the floor, according to committee co-chair Cynthia Mitchell, because of the MVC donation and the volunteer help. The study is the result of sometimes contentious discussions over almost 10 years concerning the condition of Mill Pond and whether the pond should be dredged to maintain its scenic value or whether the dam that creates the pond should be removed and allow parts of the watershed to return to their natural state. A dozen people attended a public forum Tuesday, March 24, at the West Tisbury library where the committee of seven presented the major points of the study goals and methods with a PowerPoint presentation, accompanied by talks by committee members Selena Roman, Mr. Hodgkinson, and Ms. Mitchell. The presentation was videotaped, and will be available on MVTV. Mr. Hodgkinson said anyone willing to volunteer to help with the study can call 508-696-9322 and leave return contact information. He said there will be training sessions on methods and protocols as needed.